ACC: Just defeated a Level 12 Pactonal Captain with my level 8 Engineer. ACC: Right after that I defeated a Level 12 Stone Assassin with the same character. 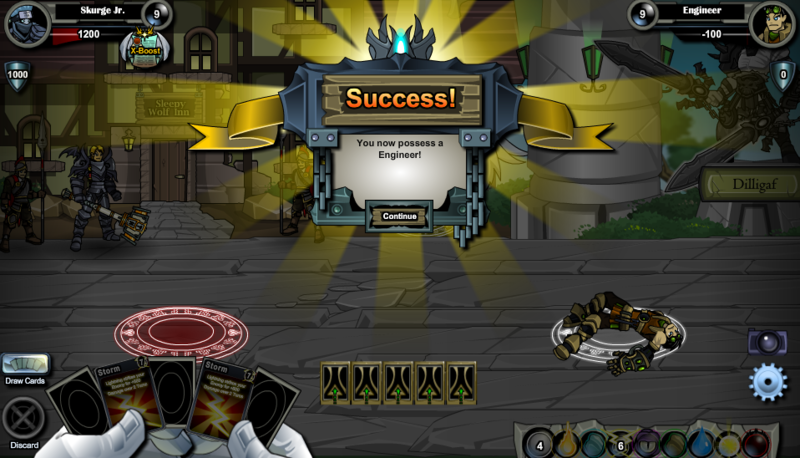 ACC: Finally got Engineer to level 9. DIS: Until then, I will wait to come back in-game and hopefully OS will have change for good, will miss a few people. DIS: Still don't have have Water Apprentice. EDIT:So I thought I had 8 fights left, but it was like NOPE! and I was level 20.FATHER TIME! DIS: 46 53 battles (and counting) but no Engineer. ACC: Speak of the devil..
DIS: 300K gold spent, and no nature's gift from the CC. DIS:Spent 30k on Earth packs, and I got 6 204 attacks, 3 101 attack, and 1 Pierce. ACC: I got engineer. You have no idea how happy I am after farming for 4 hours. ACC: While farming for the Engineer, I got Blood Fiend to it's final rank. ACC: Bought a Lightning Pack. ACC: Got some ok cards. DIS: 2 more gold packs and... a Stone Strike. I mean c'mon, what does it take to get the cards you want??? I've gotten all of the rare cards except Mountain Strike and Stone Wall. Oh wait, and the 525 card (that's a relief). DIS: Taking too long to farm gold with Evil Jim. I liked Volt Engineer better but he's level 20 now. ACC: All of my main characters for each element are at least level 10. DIS: Still no Water Peasant after evolving that to Water Apprentice.